The Cherry Street Fountain lies with Macon's Third Street Park. Macon’s Third Street Park stretches from Plum Street to Walnut Street. Cherry trees line the walkways and can be viewed fully blossomed during the spring. 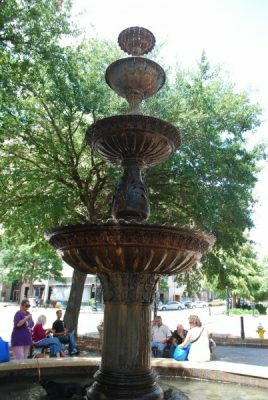 The Cherry Street Fountain is also a location for a number of events at Macon’s yearly Cherry Blossom Festival during the spring. This fountain is a native to Macon, Georgia. It was originally built in the 1950’s and rebuilt in 1980. This fountain was made by Mallary Taylor Ironworks (a local company) was originally located in the park on the opposite side of Cherry Street in 1920 through at least 1927. During the year of its renovation was when it was relocated to the other side of the street, which is its current location. Standing twenty feet tall, the fountain is divided into four basins which shrink as they ascend. The base of the fountain, which is very large, holds the water. The base that holds the water is wide. This piece was originally built by Robinson Iron Works Company, which is located in Alabama. Currently this piece of art work is owned by the city of Macon and maintained properly by the Public Works/ Parks Department.